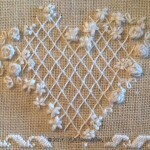 The design is called Heirloom Wedding Sampler. 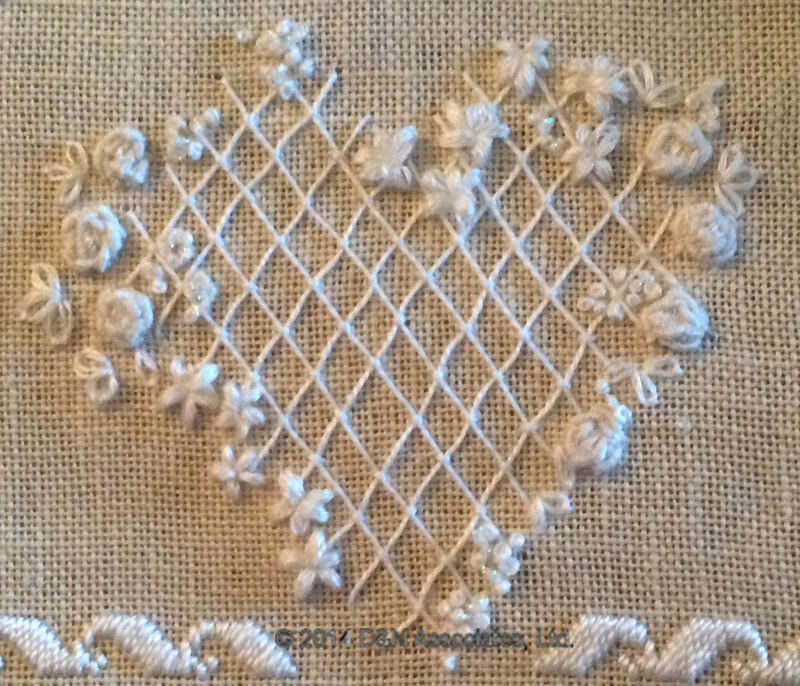 This is one of the Victoria Sampler Designs in the Sept 2014 cyberclasses. Photo below shows my completion of the second (out of six weeks) utilization of the cyberclass instructions. The Victoria Sampler Heirloom Wedding Sampler pamphlet includes three sizes of this design: Larger version (which I am currently stitching) has design area: 302h x 72w, 28 count Platinum Cashel. Worked area of the design is 21.5 by 5.25 inches. Mine will be shorter than this as the design included two areas of lettering which I will not be doing within this project. Smaller version has a design area: 232h x 48w, Model: 28ct Platinum Cashel, 16.5 x 3.3 inch. Box Top with a design area: 64w x 64h on 28 count cashel, 4.5 inch square includes the floral rose heart with a satin motif edge border around the heart. I plan to do this using a dark blue or purple cashel fabric with the stitching in the white tones that I currently am using on the platinum cashel fabric. 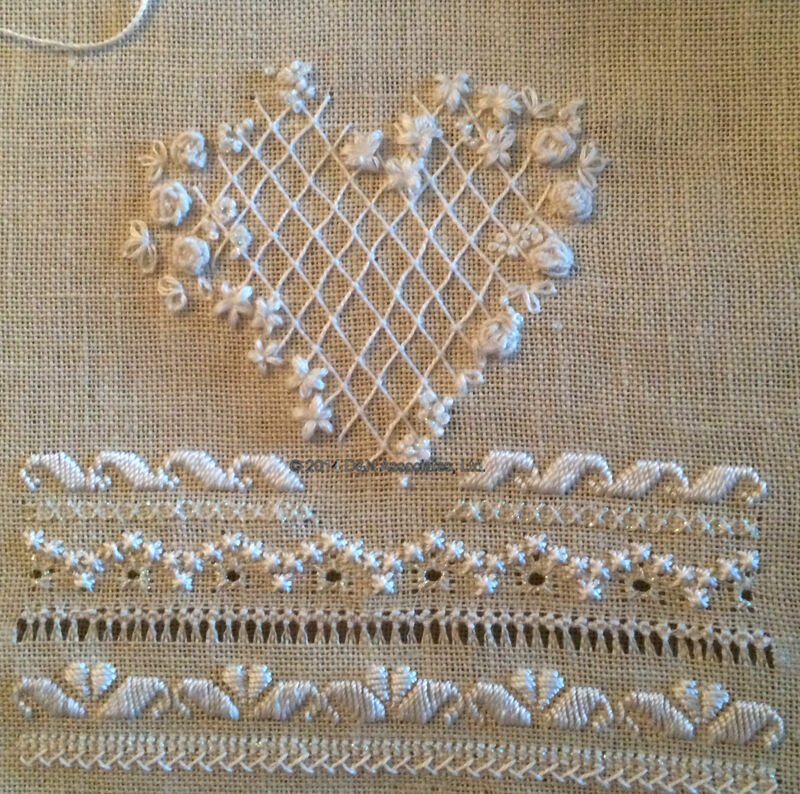 This is stitched is a white range of YLI silk ribbon, beads and threads: Au ver a Soie, Kreinik #4 Braid, Kreinik Silk Mori, Trebizond silk and DMC pearl cotton. Photo below shows my completion of the second week’s lessons. I have found the combination of the class notes and the instructions within the pamphlet have greatly helped me improve my stitching. We will not be adding the silk ribbon flowers to the floral heart nor the beads until the last week of lessons. Though hard to see within the photo below I changed the last row to be a combination of half cross stitches along the top of that row and herringbone stitches (instead of Smyrna Cross Stitches) below.